After learning the how to solve discount problems and the strategies how to solve them, it is now your turn to solve discount problems. Solve each problem as fast as you can. You can check your answer by clicking the red + button after each question. 1. You were walking and saw the following sign in a shoe shop. How much is the discount and sale price of a shoes worth Php1600.00? 2. A coffee shop label its 1 cup of frappuccino 10% discount. If 1 cup of frappucino costs Php150, how much will the customer pay upon ordering? 3. After a 10% discount has been made, a necklace costs Php5400.00. What is the original price of the necklace before the discount has been deducted? 4. 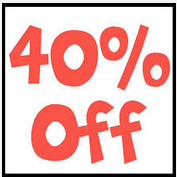 A popular mall placed a big “up to 40% off” streamer in front of its entrance. You are planning to buy a television worth Php21,550. What is the lowest possible amount that you will pay if you buy the television? 5. You want to buy a mountain in a bicycle shop where you saw a “15% off flyer.” The price of the bike was Php26350.00. You asked the owner what will be price after the discount and he replied that the tag price was the discounted price. What was the original price of the bike? 6. What is the sale price of a laptop worth Php42000.00 which has a 5% discount? 7. A plate is worth Php120 each. The shop owner told you that he will give you a 10% discount of the total price if you buy 1 dozen. How much will you have to pay if you buy one dozen of the plates? 8. After getting an 8% discount, a jacket costs 690. What is the original price? 9. You saw a cellular phone company placed a “5% off on all items”commercial on television. How much will you have to pay for a cellular phone whose price is Php5250.00? 10. You saved 200 pesos for buying an external hard drive which is marked “5% discount.” How much was the price of the hard without the discount? Did you enjoy the quiz? For more quizzes and practice test, visit the Practice Test page. How to solve question number 10 when only given the discount and discount rate?